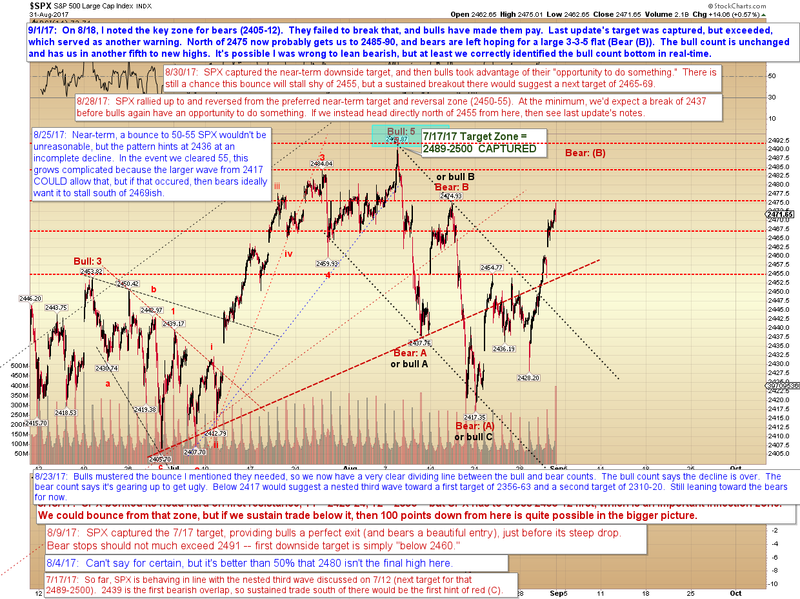 Pretzel Logic's Market Charts and Analysis: SPX and INDU: And Where Does That Leave Bears? 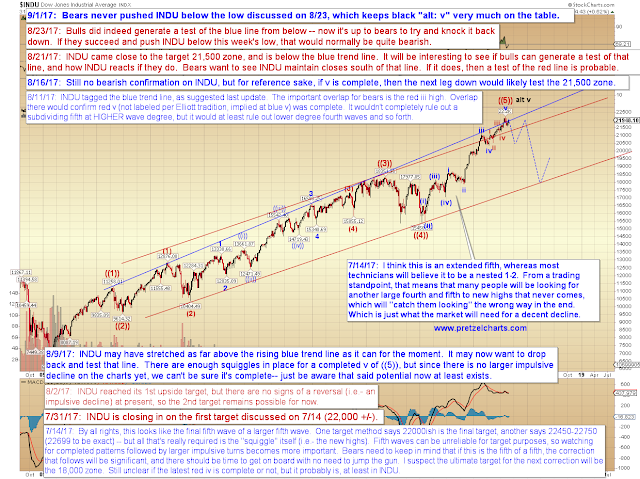 SPX and INDU: And Where Does That Leave Bears? So bears' fumble (discussed last update) may end up costing them the game. Bears have one out remaining, so it's not over just yet (we'll discuss that in a moment), but we're in the fourth quarter, and bears are behind by 5, so they're going to need a touchdown to win this thing. Presuming SPX breaks 2475 (which it look likely to do this morning, but who knows for sure -- ignore the rest of this if it doesn't), the remaining out for bears would be in the form of a 3-3-5 flat. That would have the first ABC as a larger wave (A), with the current rally in C of the larger (B), with the large (C) to follow down to new lows. The crummy thing about 3-3-5 flats is that they are all-but impossible to anticipate in advance -- but the first step with any pattern is to at least have the awareness in advance, and that we have. So, if SPX sustains a breakout over 2475, then it's probably headed toward 2485-90 (with 2489 being the "perfect world" target). 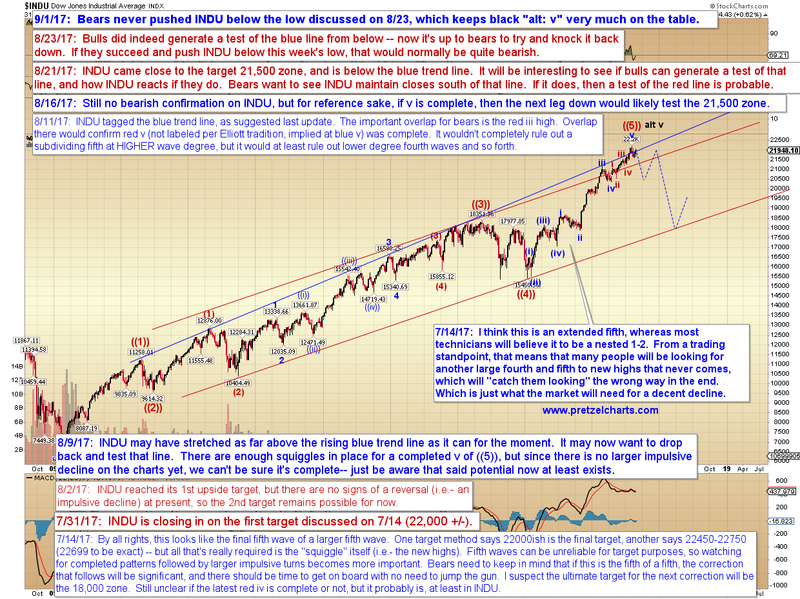 From there, it's entirely possible bears will turn this thing back down. 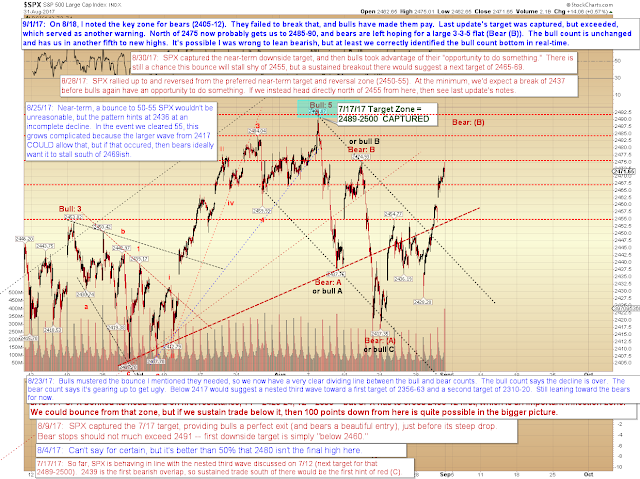 So we'll be watching for impulsive reversals to provide the next piece of that puzzle. And that's about all that can be done with such a pattern. In conclusion, bulls have continued breaking each bear warning level, while bears never broke the important bull warning level -- so we can't and shouldn't ignore that. At this point, it's pretty clear that either we're still unwinding lower-degree fifth waves (which thus would temporarily stall the big fourth wave we anticipated), or the market is going for a larger 3-3-5 flat, to punch in that a big, time-consuming fourth wave more directly. Trade safe.